The Paris Motor Show how will host the world premiere of the new PUR-O2 line that will be available on the Fiat 500, Croma and Bravo from November. This select group of versions is at the cutting edge of the international automotive scenario due to their high-tech content, low fuel consumption and low CO2 emission levels. The new PUR-O2 line confirms Fiat’s wish to develop more and more new products as part of its quest for innovative solutions to contain polluting emissions and CO2 levels. The Paris Motor Show how will host the world premiere of the new PUR-O2 line that will be available on the Fiat 500, Croma and Bravo from November. This select group of versions is at the cutting edge of the international automotive scenario due to their high-tech content, low fuel consumption and low CO2 emission levels. The result has been achieved by the introduction of special systems and devices such as the innovative Eco Drive, the new ‘Start&Stop’ device developed by Bosch and special Eco Packs that include green tyres, low-viscosity fluids, aerodynamic packages and gearboxes with modified ratios. The new PUR-O2 line confirms Fiat’s wish to develop more and more new products as part of its quest for innovative solutions to contain polluting emissions and CO2 levels. Fiat is incidentally one of the motoring brands providing the best response to the need to limit the impact of transport on the environment. The company JATO – world leader in automotive research and consulting, set up in 1984 and present in more than 40 countries – recently announced that, out of the ten biggest selling automobile brands in Europe, Fiat Automobiles is the brand that achieved the lowest average CO2 emissions value for the cars it sold in 2007, i.e 134.6 g/km. 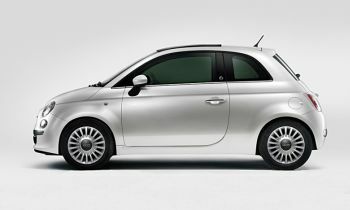 And more, again in 2007, the CO2 emissions of no fewer than 23% of the cars sold by Fiat were lower than 120 g/km and 67% of Fiat cars achieved a level of less than or equal to 140 g/km. Heartened by this result and irrespective of what will be decided in Europe, Fiat Automobiles is aiming to achieve the lowest average adjusted level of CO2 emissions for its cars by 2012. Fiat intends to pursue its goal by introducing a targeted campaign on its engines, transmission and cars and also the structural use of the Start&Stop system. The Stop&Start system was developed in conjunction with FPT – Fiat Powertrain Technologies and includes a special reinforced starter motor produced by Bosch in addition to a particularly advanced control strategy that analyses a host of engine, gearbox and climate control parameters to reduce fuel consumption and emissions while upholding the Fiat 500’s high handling and reliability standards. The PUR-O2 version, built on the basis of a Fiat 500 Lounge, is fitted with the tried and tested 1.2 petrol engine and equipped with the Start&Stop system, a device that turns the engine off temporarily and restarts it during periods when the engine would be idling with the car at a standstill. In these situations, typical of congested traffic in urban areas and while waiting at traffic lights, and when control strategies permit it, the system automatically turns off the engine to allow a significant saving in fuel (more than 10% reduction in fuel consumption over an urban cycle). As soon as the brake pedal is released or a gear engaged, the system then quickly restarts the engine to ensure the user an immediate response to controls. The Start&Stop also offers further advantages in terms of passenger compartment comfort due to the lack of vibrations and noise. The system therefore represents a high-tech and smart solution to the requirement for low environmental impact cars with good fuel economy. The PUR-O2 version of the 500 can boast the lowest emissions in the petrol range (CO2 emissions: 115 g/km), and is also equipped with the Eco Drive system. From January 2009, it will also be possible to combine the system with a Dualogic gearbox that allows optimum management of gear shifts and offers high mechanical efficiency. In detail, the automated transmission offers a basis for smart management of engine on/off status, shaving even more off fuel consumption figures and guaranteeing CO2 emission levels even lower than 115 g/km. By controlling the clutch, the system can disengage the engine from the transmission whenever drive is not required and the engine can be turned off. The Fiat Bravo is a leading seller in the most competitive market segment, i.e. compact saloons, and continues to flaunt its unchallenged technological leadership with its PUR-O2 versions equipped with a 1.6 Multijet engine delivering power outputs of 90 bhp and 105 bhp. In detail, the new versions offer particularly low CO2 emissions (only 115 g/km on the 90 bhp 1.6 version and just 119 g/km on the 105 bhp 1.6) in addition to particulate values pegged at minimum levels due to a standard-equipment particulate filter that few competitors offer as a standard item on their greener versions. The technical changes that have made it possible to achieve these absolutely outstanding results for the category include lengthening of the gear ratios, the use of tyres with a low friction coefficient, the use of low viscosity lubricant oil and a special engine control unit setting. The PUR-O2 version is another item in the long list of new products that have been introduced since the launch and make the Bravo model the benchmark in its category in terms of style and also, increasingly, for its proven substance and state-of-the-art technology. Examples include the introduction of the powerful Turbo T-jet petrol units and the revolutionary 1.6 Multijet diesel engine (the only Euro 5-ready engines in the category); the use and application of the most sophisticated systems and devices for passenger protection and for control of the car's dynamic behaviour, as evidenced by the introduction as standard of a state-of-the-art ESP (Electronic Stability Program) device (the Fiat Bravo was not awarded a sought-after 5 star rating by EuroNcap for nothing); the option of ‘Blue&MeTM’, a system created as a joint venture between Fiat Group Automobiles and Microsoft that has brought a quantum leap in in-car communication, information and entertainment paradigms to improve comfort and the quality of time spent on board – and lastly Blue&Me Nav, an ultra-efficient pictogram navigation system that allows access to a simple and useful set of telematic services at the best price on the market. Not to mention the fact that recently the new Dualogic sequential gearbox was launched on the Fiat Bravo. This offers two operating modes: automatic mode, designed for comfort and fuel consumption, and manual mode for greater driving satisfaction, enhanced by paddle controls behind the steering wheel. With respect for the environment still in mind, the French motor show also welcomes the prestigious new Croma PUR-O2 equipped with the lively 120 bhp 1.9 Multijet engine and fitted with a particulate filter as standard. The new PUR-O2 version, available from the end of September, ensures considerably reduced fuel consumption and CO2 emissions (140 g/km of CO2, 17 g/km less than the current version), without compromising on performance. This major result is being achieved as a result of technical changes such as a lengthening of the gear ratios, the adoption of tyres with a low friction coefficient, the use of low viscosity lubricant oil and the use of low suspension settings. Fuel consumption over a combined cycle also drops from 6.1 l/100Km to 5.3 l/100Km, that means a fuel saving, over an average distance of 30,000Km, of approximately EUR 300 per year. In this way, the PUR-O2 versions guarantee a certain benefit to the environment together with considerable financial saving. Last but not least, the Croma PUR-O2 will also come with cruise control as standard, to ensure greater respect for the environment: this feature helps to keep fuel consumption and emissions down by helping to maintain a smoother, more regular drive. The PUR-O2 version is an extra option for this recently face-lifted model that is at the top of its category for its great roominess and on-board space - particularly for rear passengers, excellent visibility and driving comfort. The car offers superlative safety equipment, with 9 airbags and also state-of-the art diesel engines, all with a particulate filter as standard. It is also the only car in its category that does not require the first service until 35,000km. These strengths combined with respect for the environment makes the Nuova Croma an ideal choice for the family.